-In this set of as many as 24 silver devices, the approximate total weight of 1260 grams. 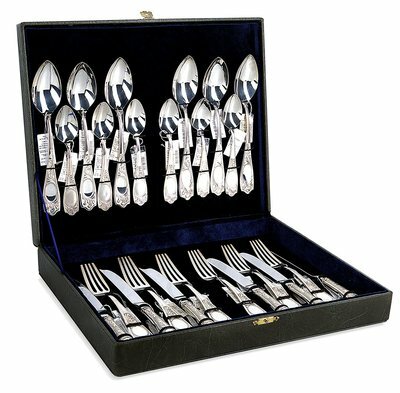 -The exceptional quality of silver cutlery will not leave indifferent lovers of beauty. This magnificent set of silver cutlery is made according to the old traditions of jewelry making. It will be an excellent addition to your interior and will decorate any holiday. Table set for 6 persons from silver. Approximate weight of the set is 1260 gramm (44 oz). The set includes a dining knife - 21 cm (6 pieces), a dining spoon - 19 cm (6 pieces), a dining room fork - 18.5 cm (6 pieces) and a tea spoon - 14 cm (6 pieces). Car boot sale ad details Silver Dinnerware Set, Cutlery, Silverware, 6 People for sale in London. Silver Dinnerware Set, Cutlery, Silverware, 6 People available on car boot sale in London. More Kitchen & cooking for sale in London and more second hand sale ads for free on 2lazy2boot - London car boot fairs - 39369.